ATTENTION!! THIS SET HAS BEEN COMPLETELY RESTORED SINCE IT WAS ORIGINALLY POSTED. THE SET IS NOW IN NEAR PERFECT CONDITION. THE SHELLS AND HARDWARE HAVE BEEN PROFESSIONALLY POWER POLISHED BY THE BEST EXPERTS IN THE BUSINESS AND RESTORED TO THIER ORIGINAL LUSTER AND SHINE. SEE PHOTOS BELOW. 11√ó7, 13√ó9, 16√ó14, 26√ó14, 7√ó14 snare. 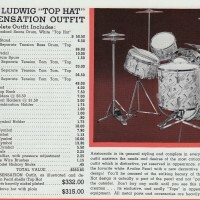 The Ludwig Top Hat and Cane “Swing Sensation” model set is considered by collectors to be the rarest and most sought after production drum set ever made. This model was produced for less than 2 years in 1940 and 41. 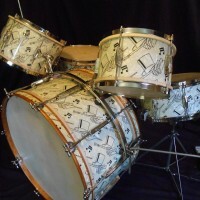 It was considered to be the absolute pinnacle of the drum set industry at the time. The best that money could buy! To date, fewer than 15 of these sets are known to exist in the entire world. Somehow, I have had the extreme good fortune and luck to have owned 6 of these sets in my life. This is one of 3 Top Hat and Cane sets currently in our collection. This set is without a doubt the finest example of a Top Hat set I have ever seen. It is safe to assume it is the best Top Hat set in the world. If a better example exists I would love to know about it. Please send photos. 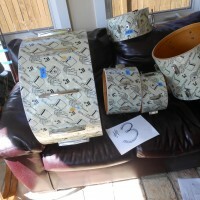 This set was acquired locally from the nephew of the original owner. The condition of this set is extraordinary. The photos speak for themselves. 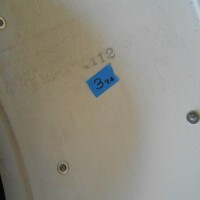 The finish is nearly unfaded. Look at the photos of the shells with the heads removed to see how close they are to the original color. They are practically perfect. 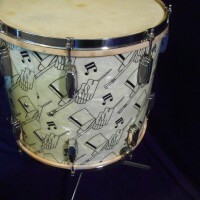 All drums are date stamped in 1941. 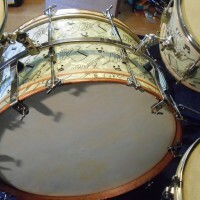 Interiors of bass and snare shells are painted white. Interiors of toms are finished in clear lacquer. This is how the interiors of every Top Hat set I’ve seen were painted. 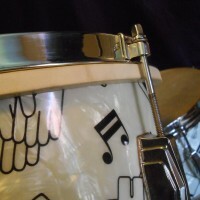 There are 4 small round brown stains on the finish of the bass caused by the rubber feet of the rail assembly resting on the top of the drum. 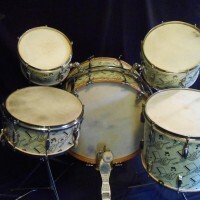 These are very typical of drums that used this type of rack. They are not visible when the rack is in place as the feet cover the stains. The nickel hardware is buffed to an amazingly brilliant shine. The photos depict the condition of the set very accurately. The shells and edges are excellent with no cracks, holes or dents. All parts are original and in excellent condition. 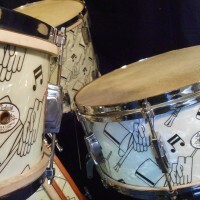 Calf heads on top and bottom of all drums. 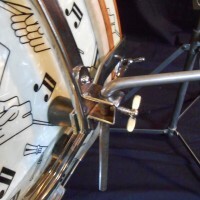 The floor tom was factory drilled for the same mounts as the rack toms. 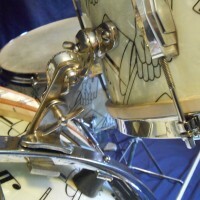 Apparently the original owner had mounted the floor tom from the rack along with the other 2 toms. 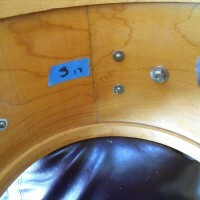 The 2 original holes have been filled with carriage bolts and the floor tom now rests in the original basket mount. 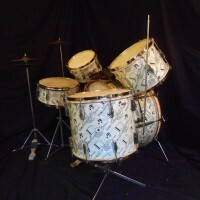 A complete set of hardware, cymbals and accessories shown in photos PLUS the original 1940s Ludwig and Ludwig catalogue that displays this set are included. Due to the extreme high value and rarity of this set we will only ship via freight. All drums will be professionally packed in cases, then in boxes and the put on a pallet. This keeps the entire set in one package dramatically reducing the chances of loss or damage. This is the safest method of shipment available. Plan on $800 to $1,000 for shipping and insurance in the US. Exact shipping cost will be determined based on buyers location. Local pick up is welcomed. I will gladly offset part of travel costs if buyer wants to travel to Seattle, WA to pick up in person. I will ship internationally. 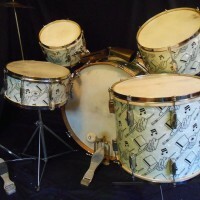 THIS IS A 100% ORIGINAL 1941 LUDWIG AND LUDWIG TOP HAT AND CANE SWING SENSATION MODEL DRUMSET. This is NOT a re-issue or re-cover!! PRICE: $37,995.00, Serious offers considered.